Publisher Simon & Schuster created a new imprint called ibooks and became the first trade publisher simultaneously to publish some of their titles in e-book and print format. Apart from all the emotional and habitual aspects, there are also some readability and usability issues that need to be addressed by publishers and software developers. 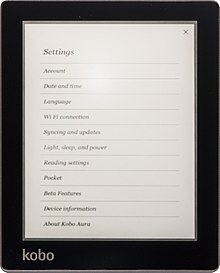 Many e-book readers who complain about eyestrain, lack of overview and distractions could be helped if they could use a more suitable device or a more user-friendly reading application, but when they buy or borrow a DRM-protected e-book, they often have to read the book on the default device or application, even if it has insufficient functionality. While a paper book is vulnerable to various threats, including water damage, mold and theft, e-books files may be corrupted, deleted or otherwise lost as well as pirated. Where the ownership of a paper book is fairly straightforward (albeit subject to restrictions on renting or copying pages, depending on the book), the purchaser of an e-book's digital file has conditional access with the possible loss of access to the e-book due to digital rights management provisions, copyright issues, the provider's business failing or possibly if the user's credit card expired. The Brazilian e-book market is only emerging. Brazilians are technology savvy, and that attitude is shared by the government. In 2013, around 2.5% of all trade titles sold were in digital format. This was a 400% growth over 2012 when only 0.5% of trade titles were digital. In 2014, the growth was slower, and Brazil had 3.5% of its trade titles being sold as e-books.